What do Crazy Horse, Mount Rushmore and Black Hills gold have in common? They’re all within reach of Hill City, a former mining town that transformed from rough-and-tumble Western outpost to a tourist mecca that dishes out thrills for visitors. Hill City is nestled in the heart of the rugged Black Hills of western South Dakota, about a half-hour west of Rapid City on U.S. Route 16. The area’s must-see sights include Crazy Horse Memorial, about 15 minutes southwest of Hill City, and, of course, Mount Rushmore, about 22 minutes southeast. You can also be in Custer State Park in less than 20 minutes. Make sure to take your camera to capture the wildlife found in this natural wonder. Several streams entice fly fishers, who frequently catch trout as big as 16 inches. Check with local outfitters for the right fly lures. 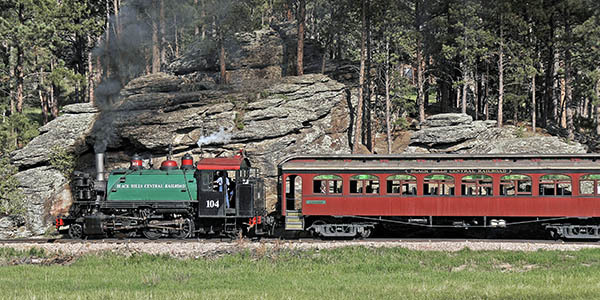 A great way to see Mount Rushmore is on Rushmore Tramway Adventures. Hop on the scenic chairlift and be transported to the summit, where you can take in amazing views of the area. The more adventurous visitors can also fly on a zipline or slide down the alpine slide. Did you bring your hiking boots? Several trails snake through the Black Hills for more scenic beauty. In the late 1800s miners flocked to the region after reports of gold discoveries spread throughout the United States. Prospectors founded Hill City, referred to as the Heart of the Hills. The once-burgeoning community hosted saloons and other attractions common to the Old West. The construction of the railroad in the area ensured the town’s viability, and today, a segment of the famous railroad has been preserved with the 1880 Train, which still traverses the area’s rugged landscape. This steam engine pulls open-air passenger cars along a standard-gauge railroad between the towns of Hill City and Keystone. Experience Hill City’s colorful past while enjoying all the comforts of modern-day living. Several golf courses in the area offer challenging fairways complete with stunning views of the nearby peaks. Thrilling ATV trails take riders to fantastic vistas, while helicopter tours show visitors all sides of the 60-foot-tall heads of Mount Rushmore National Memorial. If you prefer to see the stone faces of Washington, Jefferson, Lincoln and Roosevelt from ground level, the memorial has several vantage points with great views. There is an evening lighting ceremony that is held from the end of May through the end of September that will leave you breathless. Many of the events that occur in Hill City are centered on the attractions of Mount Rushmore and the Crazy Horse Memorial. The laser light show held at the Crazy Horse Memorial from the end of May through the end of September pays homage to the area’s rich Native American legacy. A Memorial Day Open House is held here also in the last week of May to honor Native Americans and U.S. military personnel. Throughout the summer, there are various evenings when the Crazy Horse sculpture is bathed in firelight, known to the locals as night blasts. While you’re here in Hill City you’ll want to make sure you spend some time in the downtown. There are art galleries, restaurants and lots of unique small businesses that you won’t want to miss. Give panning for gold a try at the Dakota Stone Rock Shop or at the Big Thunder Gold Mine. Or stop by Teddy Bear Town, which holds the Guinness World Record for the largest teddy bear collection. You could always look for real bears at Bear Country USA — a drive-through wildlife park. You also won’t want to miss out on the nearby Mammoth Site & Museum or the Black Hills Institute of Geological Research. There is so much more to do that you’ll have to start planning your visit today. Within striking distance of Hill City, there’s an extensive network of hiking trails woven through a rugged patch of Black Hills terrain. Something of a rite of passage for locals, one of the region’s most popular hikes is to Black Elk Peak (formerly Harney Peak), the highest elevation point in South Dakota at 7,244 feet. 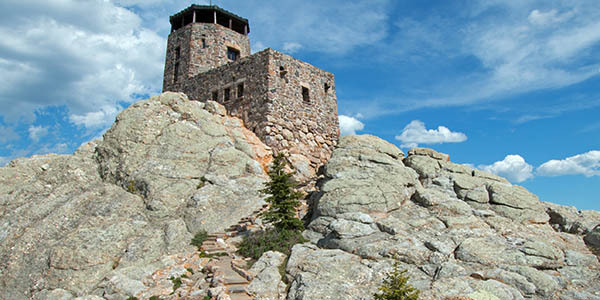 Many trails within the Black Hills National Forest lead to the peak, but the shortest and least arduous access point is the Harney Peak Trail from Sylvan Lake (in Custer State Park), which begins at an elevation of 6,200 feet. The 3.5-mile hike starts with a scenic stroll through pine forest before taking on a more strenuous nature due to switchbacks (no technical skills required) during the final climb (total elevation gain is 1,100 feet) to the summit. Novice hikers should allow four to five hours for the round trip. At the summit, there’s a stone lookout tower. Built by the Civilian Conservation Corps as a fire lookout post in the 1930s, the structure offers superb views of the surrounding forest and mountains.